This is the longest list by a couple thousand words and the 58 videos (most with clips from multiple years) of current Yankee prospects on the FanGraphs YouTube page is the most of any team. Some of this is due to my history with the organization and proximity to their Spring Training home, but mostly due to the depth this once-maligned system has developed. The big story with the Yankees farm system is their July 2nd spending spree last summer and the harsh critiques ownership gave the player development and scouting departments the summer before that. One led to the other and now things look to be in a much better shape. It’s still too early to pass judgment on the July 2nd group, but all of the high bonus guys are listed below either on the list or in the others section. They’re the only names below that are unlinked, since they haven’t played pro games yet, only instructional league; the videos of these players are from the pre-July 2nd showcases in the Dominican and from fall instructional league in Tampa. July 2nd prospects sign contracts for the following year, so the team gets an extra year of control before having to add them to the 40-man roster, rather than starting their clock a year early for just part of a summer of games. It’s important to note that the bonus amounts in this market are more about the agent, competing teams and timing, so my rankings aren’t simply in the order of how much each player was paid last summer. The industry opinions about these players vary, as some teams weren’t in the position to sign the top player and didn’t scout them much and opinions about 16-year-olds vary a lot in general. The most advanced of this group in Spring Training will be sent to a short-season American league (likely the GCL) and the more raw prospects will stay behind in the Dominican Summer League; I try to point out which is which below. The Yankees’ drafts have been solid the last two years, with the three late first round picks from 2013 ranked 2nd, 6th and 8th in the system and all are at least meeting expectations so far, with RF Aaron Judge strongly beating them. Rival clubs kept pushing me to move up 2014 2nd rounder (the first Yankees’ pick) LHP Jacob Lindgren up the list; he should be a fixture in the late innings for the club very soon. The depth here is outstanding and is a function of solid drafts, an influx of international signees and some recent trades that added depth to the 40 FV group. With this bulk process in mind, the Yankees have the most short-season clubs of any other organization: two in the DSL, two in the GCL and two more in Pulaski and Staten Island. With that many roster spots to fill, the team can sign as many players as they want and not be forced (like many teams are) to avoid signing multiple high profile players at the same position that are at the same level. Yankees officials joked that making their Low-A Charleston roster is much more difficult now, with one comparing it to being a top recruit for Alabama’s football team, but struggling to get on the field because they’re so deep with touted players. I’ve been updating a grid with the updated rankings for each system and the Yankees are the deepest team in all three subsections of the Others of Note section, along with having the most 40 FV players and are just a couple short of having the most 45 FV players. Tampa Bay is the only other team with close to this kind of depth, but the Yankees have two top-end talents (RHP Luis Severino and RF Aaron Judge) that the Rays can’t match, which helps separate the Bombers from Tampa Bay and other deep systems. Right now, I have the Yankees as the 10th best system in baseball, but with the bulk of high upside young talent and five of the top six prospects likely returning to next year’s list making it better than 50/50 that they’ll be even higher next year. Below, I’ve included a quick ranking of the growth assets that the Yankees have in the majors that aren’t eligible for the list and Dave Cameron shares some general thoughts on the organization. Scroll further down to see Carson Cistulli’s fringe prospect favorite. Next up are the Braves, A’s and Angels, in that order. The days of the Yankees simply spending their way to the top of the standings appear to be over, or are at least on hiatus. The Bronx Bombers still spend plenty of money, but they’re not lapping the league in payroll anymore, and are now attempting to compete on a more level playing field. This culture shift means the team is actually getting younger for the first time in a while, moving away from rosters constructed heavily through free agency. It also means the Yankees aren’t as strong as they used to be, and probably have another year or two before they can begin to enjoy the fruit of their current labors. The emphasis on youth and value will pay dividends, and it’s inevitable that the Yankees will become a dominant force in the AL East once again; it just probably won’t happen in 2015. Scouting Report: Severino wasn’t a high profile signing, but stood out to me in instructs the fall after his 2012 stint in the Dominican Summer League. He sat 92-94 mph in both outings I saw and threw a solid average slider, but didn’t work in a changeup and his delivery/command needed work. That said, he was a loose athlete and definitely an arm to watch; many big league arms looked like this at age 18. Clips from these two 2012 instructs outings are at the end of the video while the beginning and bulk of the video is from a 2014 instructs outing. In the two year interim between the video clips, Severino grew from his listed 6’0/195, getting a little taller, stronger and generally more physically mature. In the 2012 video, his mechanics needed work and in 2014 he’s made almost all the necessary adjustments: he was more upright at release with a shorter stride, worse posture at release and this inefficiency led to less explosion, less stuff and less command. Severino was mostly 91-95 mph in 2013 and early in 2014, then got stronger as the year went on, flashing 94-97 mph heat at times later in the year and sustaining it for innings. For about 40 pitches in the 2014 instructs in the video, he sat 94-97, with no fastball below 93 mph. It’s obvious that maturing physically and mechanically in those two years is a positive indicator, but one of the things that stood out to me from the beginning with Severino is how quickly he loads his arm. In the picture to the right, you can see his arm in the loaded position with his foot still a couple frames from hitting the ground. I’m not a doctor, but the short version is that if that when the front foot plants and the hips are about to explode toward the plate, if the arm isn’t in the right place, the body takes it along for a ride anyway. So, if the arm isn’t ready yet, it goes sailing through the throwing motion with lots of stress, which is really bad, both for command and health. Many relievers create arm speed by doing this and that’s part of the reason they get injured so often and typically have bad command. This sort of thing happens more often with a high effort delivery and Severino’s is pretty easy, though there’s a little stiffness in the finish at times. I don’t usually break down mechanics like this, but throwing 94-97 mph regularly with some command and not cheating via loading the arm late is very rare. It bodes well for health and usually is seen in pitchers with “pure” velocity and quick-twitchiness and they’re often starting pitchers, like Yordano Ventura and Pedro Martinez. Pedro is an all-timer, but multiple Yankee execs mentioned Ventura as a comparable for Severino, though they were quick to caution to not raise expectations too high. Yankee fans would never do that, though. Severino took quickly to using a changeup regularly after arriving in America, developing it as a plus pitch in about a year of using it, though it can sometimes play to 55 on certain days, as he’s still developing consistent control of his off-speed offerings. His slider is still a third pitch, but it flashes 55 at times. The concern is that he’s throwing one pitch and, in the 2014 outing in the video, the velocity of it ranged from 82-91 mph, looking like a cutter, slider and a hybrid third pitch between them. He “accidentally” threw a 91 mph pure cutter one time in the outing that was plus, further underlining the arm talent but lack of feel for how to consistently spin the above average breaker that he clearly has in there somewhere. Summation: Severino should spend 2015 in the upper levels of the minors and be ready for a big league audition either late in 2015 or at some point in 2016; that’ll likely depend on his performance and the needs of the big club. There’s still some markers here that make some scouts say reliever and that may be how he breaks into the big leagues, but the Yankees see starter all the way. Severino’s ability to make adjustments to his delivery and repertoire along with the good health indicators of his delivery suggest he’ll figure out a way to stay in the rotation, with the upside of a #2 starter and realistic outcome of closer or #3 starter. For reference, scouts think there are 8-12 number one starters at any given time (5+ WAR) and maybe 15-20 number two’s (4 WAR); these numbers are a guide rather than a rule. Scouting Report: I saw Judge in his junior year at Fresno State, which you can pretty easily pick out of the video above by uniform colors. I thought he was incredibly talented, but the Giancarlo Stanton comps were ridiculous, as Judge was struggling to perform close to his potential in college at age 21, while Stanton already had about 50 big league homers at that age. The Stanton comps are still ridiculous for the same reason, but, physically speaking, it’s hard to find a comp. Judge is 6’7/250, is a solid average runner underway with a plus arm and plus-plus raw power. Scouts were resorting to comparing Judge to basketball players (LeBron James and Blake Griffin were common ones) to find someone other than Stanton even remotely similar. In the weekend I saw Judge face Stanford, we was a non-factor at the plate Friday versus 2013 #1 overall pick Mark Appel (on one of the best stuff days of Appel’s life) was just okay on Saturday, then went 5-for-5 with four singles and a massive homer (included on the above video) on Sunday against the weakest pitching of the weekend. I recount that weekend because there were a couple GMs are about 10 scouting directors there that weekend and it encapsulated the amateur experience of scouting Judge: mostly struggled against top arms, excelled against weaker arms and didn’t hit for enough power in games. These struggles weren’t because he didn’t have the bat speed of physical ability to hit amateur pitching, but his long limbs obviously created contact problems, which is a big reason why there aren’t many 6’7 hitters in the big leagues. Judge would shorten up to hit singles in college and scouts began to wonder if he could consistently hit for some kind of game power and make enough contact at the same time, which is why he slid to the end of the first round. There were whispers he was stubborn and uncoachable or other various mental explanations for not tapping into his raw ability. Multiple clubs I talked to didn’t have him anywhere close to the first round and some area scouts turned him in as a middle round pick. The Yankees had three first round picks at the end of the round and know that most 45 or 50 FV big league players don’t really move the needle for them, so they were in a position to take a risk and Judge was on the board, as they hoped he would be. After signing late and sustaining a quad injury that kept him from playing in the regular season, 2014 was Judge’s first pro experience and he has smashed mine and everyone else’s expectations. Some scouts wondered how quickly or if Judge would get out of A-Ball and, this year, he smoked Low-A and High-A for a combined .308/.419/.486 with 17 homers and 89 walks in 543 PA, then raked in the Arizona Fall League: .278/.377/.467 over 106 PA. He still isn’t completely tapping into his raw power, but no one saw him hitting for good average/on-base and 21 homers in his first full season unless it was all taking place at Low-A. Yankees development people keep telling me that they aren’t responsible for making any notable changes to his swing when I ask what was different this year from past years. The Yankees let kids do it his way in his first season, then they can then make adjustments if things don’t work. It suggests something at Fresno State wasn’t right that Judge is performing so well by dictating his offensive development. I put his hit/game power grades at 5 and 6, but if Judge can continue this performance at the upper levels, both grades may be a notch light. He’s making adjustments and Yankees’ personnel are all praising his work ethic, makeup and ability to know what’s necessary for him to succeed. The phrase “we just stay out of his way” was thrown around by a couple sources and it seems to be working so far. Summation: Judge will head to Double-A next year at age 23 and should be challenged, but likely will also get a taste of Triple-A, where he’ll be age appropriate for a top prospect after taking a little while to get going at the plate. If he keeps hitting, he should be in line for an extended big league look in 2016, with a chance for a 2015 September look or a slower path with him sticking by 2017. We haven’t yet found the limits of what Judge can do and he hasn’t even really tapped into his raw power in games yet, so he could struggle at the upper levels or just keep proving scouts wrong. Scouting Report: Bird has been an under-the-radar prospect in a high profile system, but had a breakout year in 2014 after getting on the radar with a strong full-season debut in 2013. Bird was an overpay (for a surprisingly high amount, to the industry) in the 5th round out of a Colorado high school, so we’re talking about a high school first baseman (who caught at times, but everyone knew that wouldn’t work) with limited physical projection from a cold weather state without great competition. He was banged up and just alright after signing and in short-season leagues/instructs in 2012, then hit way more than expected in Low-A in 2013: .228/.428/.511 with 20 homers as a 20-year-old. Bird still has a good arm from his catching days that was enough for the Yankees to consider letting him catch after he signed, until a back injury nixed that idea. He moves pretty well around the bag and is fine defensively, but it’s all about the bat here. I got reports that Bird looked like a young, healthy version of Nick Johnson, but given just one season of performance with little background and the limits of a first base profile, scouts were still cautious. Bird performed well above league average while aged correctly for a prospect in High-A in 2014 (making for a scary middle of the lineup with Judge), then hit even better in a late-season Double-A promotion and carried that level of performance to the Arizona Fall League. Bird has an advanced feel for the strike zone and is more of a hitter who has power than a slugger that swings from his heels. One way that scouts pick up on this is that Bird will not show you all of his raw power in BP. I’ve seen Bird take BP at least a half dozen times and, while Judge will let it loose in the last round and Gary Sanchez tries to put a hole in the outfield wall in most of his BP swings, Bird will just hit line drives all over the field with every swing. I’ve seen him hit homers in games to all parts of the ballpark and seen him carry the center field wall by 30 feet. It’s plus power and it might be a 65, I just haven’t seen it in BP to confirm. I also couldn’t get this out of my head when writing this report. Summation: Bird will head to the upper levels for 2015 and, like Judge, if he keeps mashing may be a big league option by the end of 2015. More conservatively, there will be some challenges and things to work on and the ETA is likely sometime in 2016. Scouting Report: To give you an idea of how much Lindgren improved in his junior season at Mississippi State, I saw him pitch as a sophomore and he was so generic that I didn’t even pull out my camera to get a couple pitches to refer back to later. He was a starter and mostly worked 87-90 mph with average stuff and some moxie. He was a 6th-10th round type prospect, maybe lower, but he noticed in side sessions, summer ball and scrimmages that he was more comfortable and threw significantly harder in short stints, sitting in the low-90’s on the Cape in short bursts. Lindgren went to his coaches and said he wanted to be relief only in his junior year and hit 96 mph in the fall before his draft spring, letting scouts know they had a new prospect to follow. Lindgren’s numbers were completely stupid in relief for the Bulldogs: 55.1 innings, 23 hits, 25 walks, 100 strikeouts. He was sitting 91-94 and hitting 95 mph with a 65 slider, usable but rarely used changeup and average command. After signing, the Yankees sent him from Rookie ball to Low-A to High-A to Double-A, and Lindgren’s combined line continued being stupid: 25 innings, 12 hits, 13 walks, 48 strikeouts. In the span of a year, he went from generic pitchability lefty in the SEC to completely untouchable in Double-A and arguably the best relief prospect in the game. He also was part of the Mississippi State bullpen’s rap group The Bench Mobb (Lindgren’s rap name is Chunky) with predictable results at 1:55 of the track. About the Ranking: I had Lindgren near the end of the top 10 this entire process, then a couple scouts told me to move Lindgren up and started asking me would I trade Lindgren for (some player I had below him). I had already thought about the value of starters/hitters versus relievers, but the didn’t realize that Lindgren isn’t just a reliever, but a slam-dunk big league contributor in 2015 that could be closer-level by the end of the year. Mateo is ranked just below Lindgren and his most notable experience is a few weeks in instructs that we don’t even have stats from. Mateo will go to Low-A next year, with the hope that he’ll be big league ready in 3-4 years. Mateo’s upside is higher, but there’s waiting time, risk and very little other than raw tools to judge by. Lindgren may have racked up 5+ wins and be in his arbitration years before Mateo even makes it on the 40-man roster. Summation: I feel like a Lindgren for Mateo trade this offseason, while obviously impossible, would reflect the higher-than-expected value we’re seeing the industry put on prospects that might be a 50 next year with six years of control. It’s implicit in these lists that when players have the same grade or are within a few spots of each other, you can feel free to flip the order a bit, but I think this is where Lindgren belongs. This means that 25 pro innings shot Lindgren from the 55th best prospect in his draft class to 15th or 20th. Prospect writers are hesitant to jump a player that much that quickly after a pretty comprehensive draft ranking process months earlier; this is a bias I talked about around the 16 minute mark in this week’s podcast that I’m trying to get past. Maybe his value craters next year and future draft studies just see him as a bust that looked good for a minute, but there’s significant trade value here and that’s the definition of a good pick: creating value. Scouting Report: The Dominican shortstop was a low profile signings in January 2012 and jumped on the prospect scene this season with a breakout stateside debut in the GCL. Mateo has grown an inch and added 25-30 pounds since signing and 2014 wasn’t even his first strong performance: he hit 7 homers and stole 49 bases in 299 plate appearances in the Dominican Summer League in 2013. Scouts were telling me about Mateo early in the GCL season with his 80 speed attracting a lot of attention, but his breakout GCL season was ended early by a broken finger. I didn’t see Mateo until instructional league in Tampa, which is where the above video was shot. Summation: Mateo likely heads to Low-A next year in what will be one of the most anticipated full-season debuts in baseball due to his buzz, upside and lack of experience stateside. 6. Ian Clarkin, LHP Video: Clarkin doesn’t have the typical projectable frame of most 1st round prep arms, but he has more feel and current stuff than his peers. After going 33rd overall in 2013, Clarkin had a nice full season debut in 2014, working 90-93 and hitting 95 mph, with an above average to plus curveball and a changeup that drastically improved to now regularly flash average. There’s 3rd/4th starter upside here and there’s reason to optimistic as Clarkin is young for his level and is getting results and ground balls due to above average stuff and feel. 7. Robert Refsnyder, 2B Video: Refsnyder was below the radar as an amateur, going in the 5th round in 2012 out of the University of Arizona. He played right field in college and was seen as a potential reserve. The Yankees saw a little more and moved him to second base, where he’s fringy to average defensively now. The bat has played more than expected, with a huge 2014 in Double-A and Triple-A at age 23, flashing advanced feel to hit and bat control with average raw power and an above average hit tool. Refsnyder’s swing is a little awkward, but he makes it work: he starts with high hands and has a high leg kick, but it’s controlled and he loads his hands lower late, allowing him to have a short, direct stroke. The expectation is that he’ll compete for the second base job this year and if the bat, power and defense all play as expected, this could be a solid everyday player. Also, I may be alone on this, but his name sounds like something Scooby Doo would say when he’s confused. Note: I split the 45 and 40 FV groups further with 45+ and 40+. Clarkin and Refsnyder are the 45+ FV prospects and Austin, DeCarr, Wade, DeLeon and Flores are the 40+ FVs. 8. Eric Jagielo, 3B Video: Jagielo is a pretty straightforward prospect: he has plus power from the left side and the hope is he’ll have a 50 bat and 50 defense at third base, but both are a little fringy right now for scouts. If it all clicks, he’s an above average regular and those two tools hold at fringy or below average, he’s a borderline 45/50 FV first baseman. Jagielo was the first of three first round picks in 2013 (26th overall) as he was the most advanced at the time, but the two chosen behind him (Judge and Clarkin) were upside plays that have both played well so far. Jagielo had a scare in instructs after being hit in the face by a fastball, breaking a bone, but every indication is he’ll be fine and ready for Spring Training. 9. J.R. Murphy, C Video: Murphy is somewhere around Refsnyder as an upper level position player ready to contribute to the big league team, but scouts are a little more wary of Murphy’s chance to become an everyday player. He’s a 50 hit, 40 power type without a ton of offensive impact, but he’s better defensively, with a plus arm and at least average defensive skills. Some scouts still see some aspects of defense for him to work on, but indications from the analytical folks are that he’s an above average framer, so if that holds up and he reaches his offensive upside, there could be an everyday catcher here. 10. Luis Torrens, C Video: Torrens is still a ways off–he’ll go to Low-A as a 19 year old next year–but he flashes a Jason Kendall like skillset. Torrens shows the ability for an average to above bat, enough power to punish a mistake (there’s a homer from instructs in the linked video), solid athleticism to stick behind the plate, a plus arm and good feel for the game. The Venezuelan was converted to catching full-time after signing for $1.3 million in the 2012 July 2nd class and has taken to it well so far. 11. Gary Sanchez, C Video: You’d think the toolsier, older catcher that’s proven at a higher level would be above Torrens, but the red flags on Sanchez are starting to worry scouts. Youthful mistakes and lack of maturity are expected for kids that get $3 million when they turn 16, but scouts are still regularly using expletives to describe Sanchez’s makeup. Multiple sources have been telling me for multiple years that Sanchez appears to have no interest in catching, despite having the raw tools to catch and a 70 arm. He’s a 30 runner at best that flashes 70 raw power with a max effort swing in BP, but it plays more to 60 in games. While there’s some associated prospect fatigue with him being on the radar for so long and not quite breaking out, he’s performed well statistically in Double-A at the same age as a college junior. Sanchez has above average bat speed and bat control, but still varies his approach from pitch-to-pitch so his results don’t always match the raw tools. Most scouts assume he’ll become a 1B/DH, like previous huge bonus July 2nd Yankees catching prospect Jesus Montero, and there’s still the tools for a 50-55 bat and 60 game power, which is enough to be an everyday bat anywhere you put him. That said, some people just don’t want to bet on the makeup changing and Montero’s path gives a compelling case to steer clear of Sanchez. 12. Bryan Mitchell, RHP Video: Mitchell has been maddeningly inconsistent with his feel and command, but got a cup of coffee in 2014 and looks ready to contribute in the big leagues in some way. Mitchell reminds me of Chris Tillman and that’s the 3rd/4th starter upside you’re hoping for here. Mitchell sits 92-94 and will run it up to 98 mph at times, with a knockout curveball that’s plus when he stays on top of it and a cutter and changeup that are both average at times. He’s becoming more of a pitcher rather than thrower and could become a starter, but also has the stuff to break into the big leagues as a late inning reliever. 13. Miguel Andujar, 3B Video: Andujar is an exciting young player that had a solid full-season debut, turning in league average offensive numbers in Low-A at age 19. He has above average bat speed and an easy plus arm, with fringy speed, a chance to be at least average defensively at third and solid average raw power. There’s plenty to project as an everyday player given the upside and youth, but there’s still a long way to go. 14. Jake Cave, CF Video: Cave is a bit of a sleeper in the system, and didn’t have a ton of draft hype as a 6th round overpay that got $800,000 out of a Virginia high school in 2011. Cave has the plus speed to stick in center field and a contact stroke with enough power to hit mistakes out of the park. One Yankees official said there’s a little Colby Rasmus to Cave’s game, with a little less raw tools and a little more feel. He’s performed well at every stop and has been young for the level. He should head to Double-A and/or Triple-A next year with a chance to break in the bigs as a reserve and a shot to become an everyday player. 15. Tyler Austin, RF Video: Austin has had a bumpy ride as a prospect, jumping from unknown to top 100 material in his breakout 2012 season, then being slowed by a wrist injury in 2013 that muted his bat speed, to now fully recovering in 2014. Austin has above average bat speed and raw power, but his approach and plate coverage still don’t look the same as they were back in 2012, with some Yankees officials admitting he hasn’t quite regained his stride since 2012, but they’re hoping he does in 2015. Austin came up as a catcher/third baseman and is a well below average runner with a solid average arm; he plays left and right field now but likely won’t play first base anytime soon. He’ll be 23 in Triple-A and could be small adjustments away from being a low-end everyday guy, but more likely ends up as a corner utility guy or platoon bat. 16. Austin DeCarr, RHP Video: DeCarr was the Yankees 2nd pick this year, signing in the 3rd round for an above slot $1 million after being in contention for their first pick, which ended up being Lindgren. DeCarr is an interesting case as a post-grad student who blew up on the showcase circuit the summer after his senior year. The Yankees tried to sign him as an undrafted free agent last summer, but DeCarr wanted to play the year out and see where it got him. His stuff improved in the spring, sitting 91-94 and hitting 96 mph with an above average to plus curveball, but his fringy changeup and command wavered at times while his feel for the curveball also came and went. There’s a chance for two plus pitches and a mid-rotation starter, but DeCarr is a year older than his prep counterparts and looked more like a late inning reliever to some scouts this spring. 17. Tyler Wade, SS Video: Wade took a big step forward this year to scouts outside the organization, but was a Yankee favorite for some time after drafting him in the 4th round in 2013. Wade took the opportunity when the more hyped Abiatal Avelino was injured or struggling at Low-A last year and the lefty-hitting Wade performed very well for a 19-year-old in full season ball. Wade is an above average to plus runner with the tools to stick at shortstop and the internal clock and instincts to get the most out of his tools. He’s more of a contact type hitter and power isn’t a big part of his game, but lefty hitting shortstops that hit when they’re young for the league aren’t easy to find. 18. Juan De Leon, RF Video: DeLeon was my favorite prospect of the Yankees’ July 2nd haul when he signed, even though he only got the third highest bonus ($2 million), behind Dermis Garcia and Nelson Gomez. He has very quick hands, with easy plus bat speed and arm strength to go with above average foot speed and power potential. As with some of his young peers facing players five years older than them, DeLeon would get out of control at the plate at times in instructs, but he made hard contact when he stayed within himself and didn’t hesitate to show off his arm in right field. It’s too early to know for sure, but there’s a good chance he’ll join the best players from the July 2nd class in the GCL in 2015. This may sound crazy, but DeLeon’s Dominican trainer, who goes by “Banana,” is known for developing advanced hitters and DeLeon is continuing that trend. 19. Ramon Flores. LF Video: Flores is one of those players that reached his upside quickly, but doesn’t have much more to offer than as a solid part-time player. He has solid bat speed, great plate discipline and feel to hit with good plate coverage, but average at best power that limits the damage he can do. Flores is a heady player with average speed and arm strength that can play all three outfield positions and should be able to contribute to the Yankees at some point in 2015 as the prototypical 4th outfielder that could hit his way into being a low-end regular for a few years. 20. Dante Bichette, 3B Video: Bichette is the son of the slugger by the same name; Junior came on late in his draft spring out of an Orlando-area high school to be a sandwich round pick. He’s had a hard time since signing of controlling his at times out of control swing that produces above average bat speed and raw power. He’s slowly making progress by having a more controlled two strike approach, but the Yankees would like to see him use that approach on every swing. After some fiddling, he seems to be close to dialing it in, but he has an adjustment period at each level and still hasn’t tapped into his power in games as much as he could. He’s also fringy at third base, with some scouts wanting to move his above average arm to right field, but the Yankees will leave him at third, as they see enough tools to be average with some work. 21. 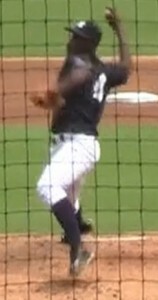 Domingo German, RHP Video: German was recently acquired in the Martin Prado deal from the Marlins this offseason. He has a plus fastball and shows the ability to stick as a starter. He works 92-94 and his curveball will flash 55 at times, but is mostly average while his changeup flashes average. German’s command comes and goes and he’ll work backwards too often, so some scouts see a reliever, but the upside is a 4th starter. 22. Slade Heathcott, CF Video: Heathcott has been on these lists for awhile and seems to move up or down 5-10 spots every year, as he shows flashes of breaking out, then gets injured or doesn’t perform as well. He was a huge makeup question out of high school (which you can Google for details) when he signed for $2.2 million in the first round. He’s now married and has settled down a lot, but he’s having trouble getting over nagging leg injuries, with the most recent being a knee problem that kept him out most of 2014. When he’s right, Heathcott is a 65 runner with an above average arm and at least 50 raw power from the left side, so you can see why that’s exciting if he’s hitting and healthy, though his plate discipline has always been just okay. 23. Jose Ramirez, RHP Video: Ramirez is one of the most exciting players on this list; in the linked video, he hit 100 mph with a 70 changeup and an inconsistent slider that flashes average to slightly above. His problem has been like Heathcott; he’s can’t stay on the field, but Ramirez was big league ready at least a year ago. None of Ramirez’s injuries have been to his arm, but to his oblique, caused by a lack of body fat and his quick-twitch movements on the mound. The big league staff has been fighting to take him north with the team the last two seasons, so if the training staff can keep him healthy, this is relief phenom-level stuff. 24. Nick Rumbelow, RHP Video: Rumbelow has slowly improved since his days as a primarily fastball guy in relief at LSU. He sits 93-95 and hit 98 mph now, with an above average, short, hard-breaking curveball in the mid-80’s that’s very hard for hitters to pick up. It will look like a splitter or slider at times and gives hitters fits. He’s improved his command and pitchability and, at age 23 next year, should be in line for a big league audition, with a chance to reach his setup potential if his stuff plays against big league hitters as expected. 25. Angel Aguilar, SS Video: Aguilar emerged this season as a prospect when he raked as a shortstop in the GCL. Aguilar comes from a long line of steady shortstops from Venezuela and has already attracted some trade interest, as MLB clubs are scouting short season leagues more than ever now. He has above average bat speed and some looseness to his swing, with good balance and a healthy cut compared to most shortstops; he hit seven homers in 39 GCL games this year, but his power should play below average at upper levels. He has the solid average speed and above average arm and hands to stick at the position, so it’s good that the Yankees have so many clubs, since other teams may have trouble finding regular at bats for all these shortstops. 26. Gosuke Katoh, 2B Video: Katoh was seen as an advanced lefty bat out of high school and early in pro ball, but really struggled in his first full season. He went in the 2nd round in 2013 as a plus runner that’s at least average at second base, has average raw power and advanced feel to hit, so the tools are still here for an everyday guy if the offensive numbers tick up next year. Yankees’ player development saw some progress in the 2nd half on 2014 and don’t seem too concerned that this will become an ongoing offensive struggle. 27. Chasen Shreve, LHP Video: Shreve was acquired with David Carpenter from Atlanta for Manny Banuelos and continues the off-season trend of the Yankees trying to create a young, controllable, power bullpen. Shreve works 90-93 and hits 94 mph with some sink, funk, deception and moxie, mixing in a solid average splitter and average slider. The 6’3/190 lefty took a step forward this year when he decided to up the effort a bit to throw harder and the results got much better; he should contribute to the big league pen this year. 28. Jonathan Amundaray, RF Video: The Venezuelan-born Amundaray got varying takes from scouts before July 2nd (he signed for $1.5 million) as some saw him perform well in games and others just saw workouts and weren’t overly impressed with the raw tools. He showed a frame that should add some muscle and power potential, but inconsistent swing mechanics. The good version showed up at instructs, with his speed, raw power and arm strength all flashing above average, including surprisingly good play in center field in a limited look. Amundaray still needs more consistency at the plate and he doesn’t have the big flashy carrying tool of some of his July 2nd peers, but his feel to hit, physical projection and 50-55 tools across the board are a nice ball of clay for the development staff. 29. Dermis Garcia, 3B Video: Garcia was the name Yankees fans heard the most around the July 2nd signings because he got the biggest bonus: $3 million. He wasn’t a consensus top five bonus guy in the class, though he was paid that way, likely due in part of his carrying tool: plus-plus raw power. If everything comes together, Garcia could hit 30 homers and play third base, but there’s still some considerable concerns. First is that Garcia was already a bigger kid that may not be able to stick at third base, with left field and first base both mentioned, but he was noticeably bigger in instructs. His swing looked a little stiff at times as an amateur and his bat looked a little slower after signing, though fatigue and some weight issues are expected after getting a big bonus in his first pro season and after his first exposure to America. Garcia is a below average runner but will show an above average arm at times, along with some feel to hit, though his swing can also get long. I’d guess he also comes to the GCL. 30. Johnny Barbato, RHP Video: Barbato was recently acquired from the Padres for Shawn Kelley. He came up as a starter, but has recently been shifted to relief as his demeanor, delivery and command all fit better in short stints. Barbato will sit 93-95, hitting 97 mph in short stints and his plus curveball plays even better with the added velocity. He’ll mix in an inconsistent and firm, but at times average changeup and should be able to command his stuff enough to profile in the 8th inning. Now that he’s a bullpen only pitcher, Barbato has a chance to be in the big leagues in the second half of 2015, but some clubs are a little worried about his elbow, after he missed about half of last season with a strained UCL that didn’t require surgery. 31. Mason Williams, CF Video: I’ve been watching Williams for years and he looked like a future stud in Low-A in 2012. He was a 70 runner with 50 raw power that just needed to get a little more patience to unlock his offensive potential. Since then, Williams has tinkered with his swing, battled nagging injuries and lost confidence along with adding some bulk so he’s now a 60 runner. He still profiles in center field and the Yankees think he’s found a swing that works for him, with a closed stance, but he’ll always be more aggressive at the plate and now is just an average defender. Right now, you’re hoping for a offensive breakthrough that can tap into his tools and produce a 4th outfielder. 32. Ty Hensley, RHP Video: Hensley’s career began with a rocky start, having his bonus adjusted down from $1.6 million to $1.2 million due to a shoulder abnormality. He pitched 12 innings after signing late in 2012, then missed the 2013 season with hip surgery. He looked to be back on track with a solid 2014 in the short-season leagues, then was hospitalized after being attacked this off-season; all indications are that he’ll be ready for 2015 and should head to Low-A. Hensley finally found some consistency this year, hitting 95 mph once again and flashing the plus curveball that made him a first round pick. He’s still learning to use the changeup and the stuff is inconsistent, but he’s showing signs of turning from a thrower into a pitcher; hopefully he’ll be 100% for Spring Training. 33. Brady Lail, RHP Video: Signing for $225,000 in the 18th round in 2012 out of a Utah high school, Lail has been below the radar for awhile, but got scouts’ attention this year. The upside isn’t huge, but he’s a solid-average stuff sinkerballer with command that pitches to contact and could be a back-end starter or swing man; one Yankees official compared Lail to David Phelps. Lail works 88-92 and hits 94 mph with alternating sink and cut and an average curveball and solid average changeup. 34. Abiatal Avelino, SS Video: Avelino was the Yankees’ hot short-season shortstop prospect name last year, then he got his full-season debut this year at Low-A at age 19 and his numbers weren’t good. He had a strong start to the year, then missed time with a strained quad and wasn’t quite the same in the second half. Avelino is thicker physically than most teenage shortstop prospects, but he’s a solid average runner with a good first step, good hands and a plus arm, so it looks like he can stick at short for awhile. There’s isn’t much power here, but he has feel to hit and a gap-to-gap approach that should show up in the stat line next year. 35. Leonardo Molina CF Video: Molina signed for $1.4 million last July 2nd, the year before the Yankees went nuts internationally. He was a 70 runner when he signed, but has added some bulk since then and is now a 55-60 runner, but is still quick enough to profile in center field as expected. Molina has more raw power than you’d expect for his size, but his bat path is more line drive oriented in games. He had terrible numbers in the GCL this year, but it says more about him that the Yankees brought him over to America in his first season than that he struggled. Molina looked solid in instructs with plus bat speed and a loose cut; he seems to have gotten his timing down and could be due for a breakout next year. 36. Nelson Gomez, 3B Video: Gomez signed for $2.25 million and was a known prospect to domestic scouts as he participated in the Under Armour All-American Game in Chicago in August of 2013 with members of the 2014 draft prep class. Gomez isn’t your classic big bonus Dominican player as he’s very mature framed: he looks like a catcher or first baseman physically at age 16. He’s surprisingly nimble on his feet in short areas, despite below average speed, and his above average arm and hands play at the hot corner for now. Gomez is a hit over power prospect with solid average raw power and advanced feel for the bat head. Gomez will need to hit and probably slim up to continue projecting as a potential everyday player, but it’s still very early. Gomez also has ridiculous hair. Ford receives frightening little attention relative to his performance — even when that performance is adjusted for age and level. Both the Ivy League player and pitcher of the year following his junior season at Princeton, Ford remained undrafted heading into the summer. He proceeded then to record the top overall regressed batting line among Cape League hitters — ahead of Max Pentecost (drafted 11th overall the next season), for example, and Casey Gillaspie (20th overall) and Derek Fisher (37th) — leading to an offer from the Yankees. He’s been nearly as proficient as a professional, recording markedly above-average strikeout rates and isolated-slugging marks (10.6% and .166, respectively) — the two metrics, those, most predictive of future major-league success for batters in the low minors — over 433 plate appearances, always while younger than the league-average age. Five prospects just missed the list and you could feel free to slide any one of them on the list as #37 if you feel strongly: LHP Tyler Webb (Video 6’6/225 lefty works 90-93 and hits 95 mph with a solid average slider and fringy changeup from different slots, with most calling him a lefty specialist, with others thinking he can neutralized righties as well, potentially as soon as 2015), 2B Jose Pirela (25-year-old got a cup of coffee last year and may get more time this year, but he lacks impact tools; he’s an early-count contact hitter with below average power that can’t play shortstop and is just okay at second base, so most scouts have him as a 25th man type), 1B Kyle Roller (Video he has typical 4A slugger look at a muscular 6’1/235 with 65 raw power and some stiffness, but he has shorter arms that allow him to hit higher level pitching more than expected; there’s a real shot he’s a platoon bat and there may be .250 with walks and 25 homers here), CF Ben Gamel (Video younger brother of Mat Gamel is a plus runner that can play all three outfield spots and has been aged appropriately for his levels, but struggled the last two years; he’s been trying to hit for power and undermined the whole package, but a contact approach should produce a solid 4th outfielder) and SS Hyo Jun Park (Video the only non-Latin prospect in the recent July 2nd group is an 18-year old Korean shortstop that draws both lazy and accurate comparisons to Rays SS Hak-Ju Lee; Park is a plus runner and lefty hitter that has the skills to stick at short and the active swing that’s common overseas, but had some trouble against top arms in instructs). There are five arms at the upper levels to keep an eye on: RHP Chris Martin (acquired from Colorado recently and I already made a Goop/decoupling joke on the Colorado list, so I’ll stick to baseball here: some arm issues in the past, 28-year-old late-blooming Indy ball arm is 6’8/215 and sits 93-96, touching 97 with lots of sink and plane, along with above average cutter and average slider), RHP Branden Pinder (Video reliever tried to become starter but now is back in relief and knocking on the door of the bigs; in relief he sits 92-95, touching 97 mph with an above average slider and usable changeup), RHP Dan Burawa (Video command has been the problem for power righty, who hits 96 mph, with a slider and splitter that both flash better than average at times, with the slider being more consistent), LHP James Pazos (Video lefty runs it up to 96 mph with deception from the left side and fringy command and off-speed) and RHP Kyle Haynes (Video prototypical power middle reliever has fringy command and inconsistent stuff, but is up to 96 mph with an average to slightly above slider and changeup at his best). There are four recent college draftee pitchers worth keeping and eye on at the lower levels: LHP Jordan Montgomery (Joining Webb as lefties from South Carolina, Montgomery is a command guy as well, but will be developed as starter; he has an 88-92 mph heater, fringy slider and above average to plus changeup with feel to pitch), RHP Cale Coshow (Video husky 6’5/260 righty was former D1 offensive tackle recruit and emerged as a pitcher after transferring from Oklahoma to Oklahoma Christian; he’s still raw and needs to watch his weight, but he works 93-96 mph with an average splitter and above average cutter), RHP Jonathan Holder (Video Mississippi State closer drew Kenny Powers comps for his demeanor and look in college, but the Yankees are trying him as a starter; in that role, he sits 88-91 mph with an above average curveball and cutter and average splitter, so you can see why the Yankees are trying this out) and RHP Jordan Foley (Video power arm from Central Michigan regressed some during the spring, with his delivery looking more stiff and his command suffering, but will be sent out as a starter and was 93-96, touching 97 mph at his best, flashing a 55 slider and 50 changeup, but more often was 90-94 mph). There are lots of one dimensional power arms at the lower levels, but three that I think show more upside and are worth monitoring: LHP Anderson Severino (Video 5’10/165 19-year-old lefty only pro experience is 11.1 innings in the DSL and his size limits his upside, but he sat 92-95 mph with above average cut in short stints in instructs and flashed an average curveball), RHP Deshorn Lake (an undrafted free agent from a small North Carolina college was born in the Virgin Islands; Lake comes from an unusual background and doesn’t have much polish, but the 6’1/210 athlete hit 100 mph in the GCL, with a splitter and slider that are still in the early stages) and RHP Domingo Acevedo (lanky 6’7 righty is late bloomer with a big arm, sitting 93-95 and getting as high as 100 mph, with some feel for a changeup and for throwing strikes, but is still working on a usable breaking ball). There are four domestic hitting prospects to watch: CF Michael O’Neill (his uncle is Yankee great Paul O’Neill but Michael has solid tools, with plus speed to fit in center field, but he needs to simply his approach and try to work the middle of the field to reach his offensive potential), CF Taylor Dugas (Video 5’9/180 grinder is above average runner that can play all three outfield spots, has an advanced sense for contact at the plate and hit in Triple-A this year, so 4th/5th outfielder could be in his near future), CF Mark Payton (Video 5’7/165 7th round senior sign in 2014 out of Texas has 4th/5th outfielder upside and performed in High-A after signing; the margin for error is small but there’s just enough tools to pay attention to him and he can play center field despite just solid average speed) and LF Chris Breen (Video late-blooming prep prospect has above average power and improving swing mechanics, but left field profile means he needs to rake to matter, which he did at Staten Island at age 20). Seven Latin hitters at the lower levels are guys to watch, which I’ll split into two paragraphs: RF Alex Palma (Venezuelan signed for $800,000 in 2012 with Torrens but isn’t as well-rounded; Palma has a mature frame with a pull-oriented approach, but there is bat speed and raw power; he hit for power without striking out much in the GCL, so he’s worth keeping an eye on), SS Yonauris Rodriguez (Video 6’0/150 Dominican got $550,000 last year as the second big signing behind Molina; he’s a defense first shortstop with the ability to stick at the position and simple, line drive stroke), SS Wilkerman Garcia (Video 5’11/170 Dominican switch-hitter got $1.35 million and is solid across the board with average to above tools and advanced feel, but nothing flashy and some think he may end up at second base eventually) and C Miguel Flames (Video Venezuelan third baseman got $1.1 million to convert to a catcher; he has looseness, bat speed and strength at the plate, but needs to shorten his swing and the catching conversion is still too early to know how it’ll work out). CF Antonio Arias (Video Yankees paid $800,000 for a raw, toolsy Venezuelan with plus speed and a loose swing, but still needs some work with the finer points at the plate and will likely be in the DSL in 2015), SS Diego Castillo (Video advanced skills over tools Venezuelan shortstop is a profile that’s been successful at producing big leaguers and the Yankees scooped Castillo up for $750,000) and RF Brayan Emery (Video signed this month for $500,000 due in part to his trainer not letting his guys be seen in many game situations, which made clubs wary of spending big money; Emery has legit seven figure ability, with 50-55 tools across the board, a smooth swing and athleticism and arm strength that can start in center field but likely ends up in right field). We hoped you liked reading Evaluating the Prospects: New York Yankees by Kiley McDaniel! Take heed, Phillies. THIS is how you rebuild a barren farm system. Except, I’d take the Phillies system right now over this Yankees one. Take it where? Out back behind the shed? I’d be interested to see how many people agree with you. I’m going to guess there aren’t many. You rebuild by spending huge internationally, and never really needing to call them up. By being able to keep a few guys like Ryfsnyder and Williams in the minors, their system looks better, whereas those guys are bench players already in half the league. By spending huge on international guys, they can gamble in the draft more. Instead of having 50 bucks worth of players, they buy 50 bucks worth of scratch offs. If they turn out, great… if not they just buy more. But with the extra cash in the international market, they are getting 100 bucks in scratchers where other teams get 50 bucks in prospects.